Philly Style Bagels makes hand-rolled, beer-boiled bagels. Philly Style Bagels is a pop-up operation that's been working out of Pizzeria Beddia (you know, that place with the best pizza in America) for over a year, providing their unique bagels to patrons on select Sundays. Collin Shapiro and Jonathon Zilber, the pair behind PSB, are now looking to go permanent by opening a storefront by Palmer Park in Fishtown. In order to make the leap, they've begun an Indiegogo campaign to raise enough dough (pun definitely intended) to buy a Montague Hearth Bake 25P-2 oven for their shop. With less than three days to go, the pair is still nearly $7,000 short of reaching their goal. Depending on your donation, the perks awarded include stickers, pint glasses, shirts and, of course, bagels and coffee. 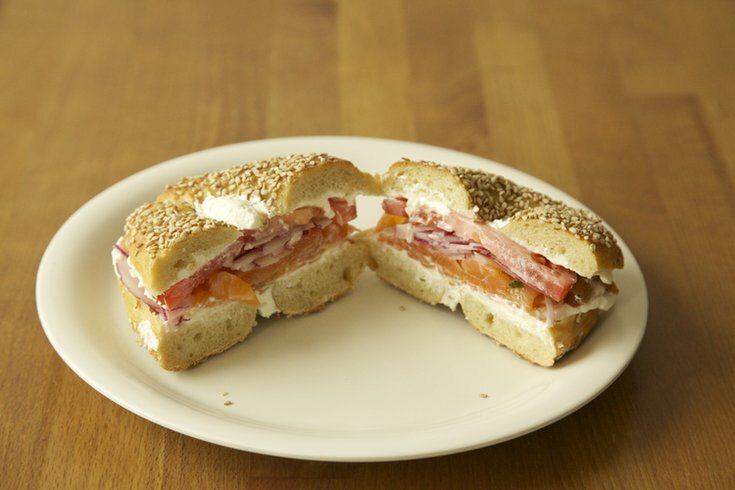 PSB is named as such because they create their bagels using different techniques than traditional New York or Montreal bakers. Namely, they boil their bagels in Yards IPA rather than malt syrup or honey, making the bagels extra crunchy, crusty and flavorful. They're hand-rolled and seeded on both sides before being baked in a stone-lined oven. If the idea that Philly could have its own style of bagels isn't tantalizing enough, PSB will also sell breakfast sandwiches and coffee at their future establishment. You can donate to their Indiegogo campaign here.